I wanted to share with you, why my brand is called Rainbow Gecko Gallery. First though let me introduce myself.....My name is Sarah, I am 33 and i live in Tasmania, Australia. I got serious about Mixed Media Art about a year ago and created Rainbow Gecko Gallery. Where did the name come from? I have always loved Geckos and the colour Rainbow. 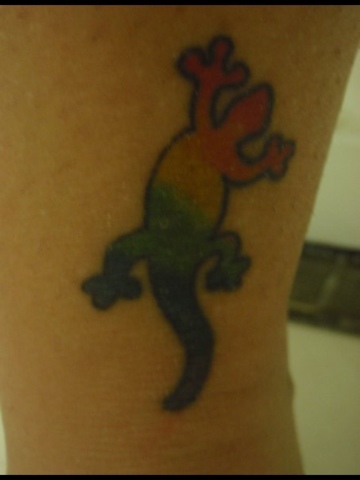 Ever since i was about sixteen I wanted to get a tattoo of a Rainbow Gecko, Now in my personal opinion, I think tattoos are overrated, everyone has one. For me, I never thought I would get one. So why did I ? I got my tattoo as it is me, in the 10 years between knowing what I wanted and actually getting it done...THE DESIGN NEVER CHANGED....I have a 5cm rainbow gecko crawling up the back of my ankle...for anyone if you want a tattoo, choose your design, think about it for a few years, and then if you still want it..get it..make sure you are 100% happy with it. IT IS PERMANENT. 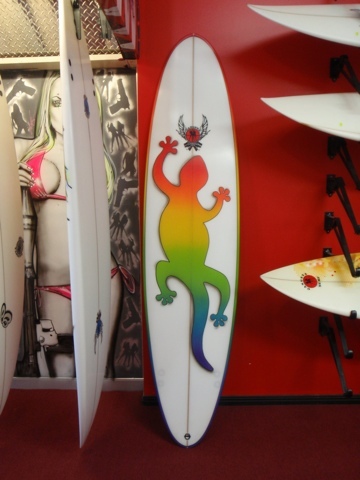 So after the tattoo a great friend of mine made me my surfboard which I designed a huge Rainbow Gecko on the front, and rainbow all down the back. It was amazing. 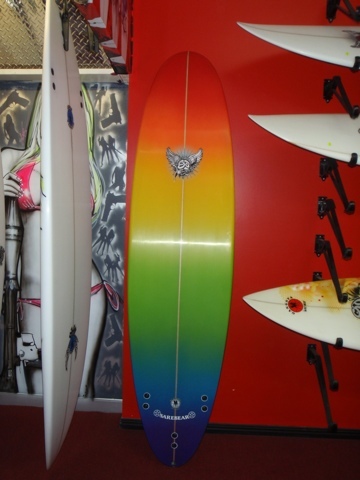 This is my Surfboard...shaped by Glen Johnson Gangsta Surf. RAINBOW: Is my favourite colour, my art is bright, colourful and RAINBOW. GECKO: Is my favourite animal, my power animal, a "solar powered" animal, just like ME. GALLERY: For the range of products I create and make, it's a GALLERY from Photography,Jewellery, Art to Stationery, Bags, and Fabrics, a little bit of everything. My works are free and expressive, always bright, metallic and glittery. I use butterfly, flower and feather imagery, I create stamps, stencils and artist collage papers to use in my artworks. I design, create, paint, draw, print, collage, sew and bead in my art and craft.